Fly Fishing Alaska. It’s still one of the wildest places on earth. Home to probably some of the best fly fishing in the world. Five species of migratory salmon, resident rainbow, grayling and dolly varden. 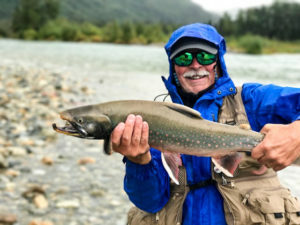 Due to the quality of fly fishing in Alaska there are many quality lodges and companies to cater to the traveling fly fisher. Hawkins Outfitters represents the finest lodge in Alaska, Angry Eagle Lodge. Located in the Bristol Bay watershed on Lake Illamna. This area is considered one of the finest areas in Alaska. Almost anytime you are fly fishing Alaska and specifically this region you will have multiple species available. Rainbows, Grayling and Arctic Char are always there. The five species of salmon, King, Silver, Chum, Sockeye, and Pink salmon have different timings on their runs. However, there are many periods when two or three species are available to the fly angler. An Alaska trip is one most anglers bucket list. 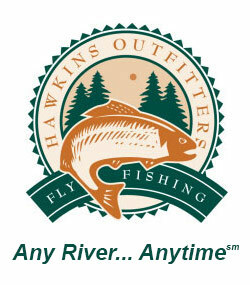 Join Hawkins Outfitters on a hosted trip or let us book you with Angry Eagle Lodge. It is an experience that you won’t forget. Chuck Hawkins is hosting a trip to Angry Eagle Lodge. The dates of our trip are August 18-25, 2018. We have ten spots reserved, four are already taken! 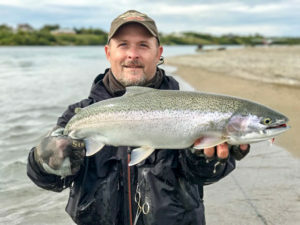 These dates are prime time for Silver Salmon, large aggressive rainbow trout, and Arctic Char. One of the guides at Angry Eagle Lodge is Jeff Topp one of Hawkins Outfitters guides here in Michigan. Jeff will be guiding us along with his hand- picked guides. Hence, we will have the very best guides at the lodge! The focus of our trip will be silver salmon, big resident rainbows, and Arctic Char. 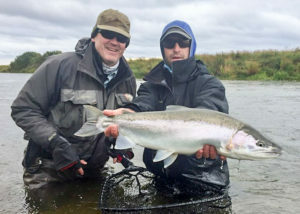 The silvers can run as big as 18 pounds and maybe you will be the angler to land a 10 pound rainbow! Both very possibly on a top water fly! The lodges offer two bed, private bath accommodations. Included are gourmet meals, beverages (excluding alcohol), three flyouts during the week and flies. Alcohol, gratuities and transfers from Anchorage are not included. As a result of fantastic fishing, incredible scenery, great lodging, gourmet food and terrific guides we will have a trip to remember. 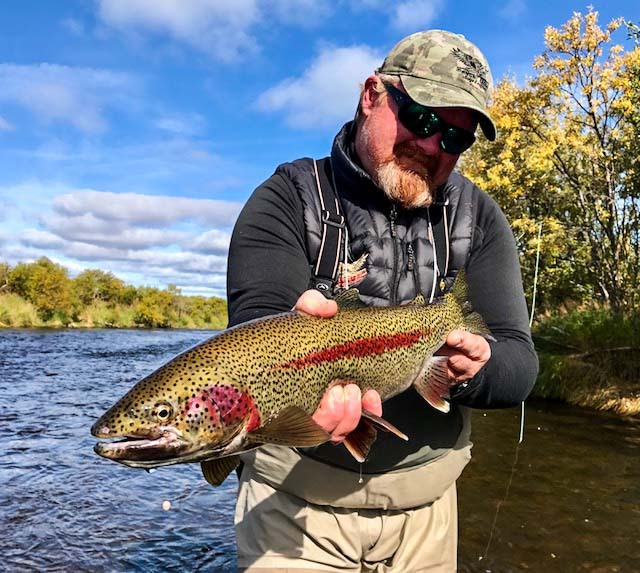 The cost for one week at Angry Eagle Lodge is $7000.That includes deluxe accommodations and meals, beverages, three fly outs during the week, guided fishing each day and flies. Not included are transfers from Anchorage to lodge, airfare, alcohol or gratuities. Join us in late August or let us help you book another week at Angry Eagle Lodge. The memories will last a life time.